The US House of Representatives has had 435 members for 100 years. Prior to this, the House regularly increased its membership to mirror growing population in the United States. This decrease in representation at the federal level has had drastic consequences for effective and fair government. As the democratic body of the legislative branch, the House of Representatives was designed to represent everyone. As Representatives have grown more and more distant from their constituents, their power has dramatically increased while their responsiveness to anyone but the highest bidder has all but vanished. With larger districts electioneering becomes the most important job and money the loudest voice, drowning out the voices of those who truly hold the power. 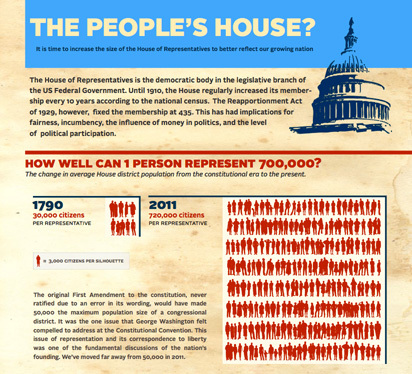 This infographic visualizes historical aspects of the US House of Representatives to help grasp its changed nature. Congressional representation was one of the most vigorously argued issues during the founding of our republic, and I believe it is still a crucial issue to the functioning of our legislative branch. Click the link to see the full graphic.